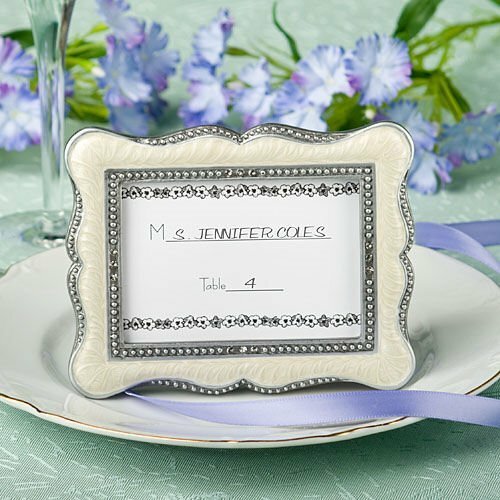 Make a lasting first impression with these dynamic place card frames! Crafted from pewter colored poly resin with beautiful inlaid ivory enamel and glistening rhinestone accents, these Victorian-themed frames are designed with gentle curves and backed with black craft paper. Each frame measures 3 1/2" by 4 1/2", can be displayed vertically or horizontally and has room for a 2 1/2" by 3 1/2" photo or place card. Favors are individually packaged in a white gift box and include a blank place card.